I believe that happiness starts with a wet nose and ends with a wagging tail. It is because of that enthusiasm, unconditional love and innocence that makes me absolutely adore dogs. 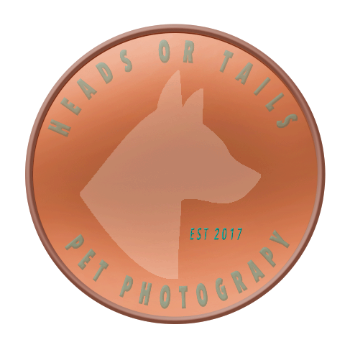 I paired that with my obsession with beautifully printed portraits and that is how Heads or Tails Pet Photography was born. If I could print every image I take, I would! To me, there is nothing better than having a beautifully printed and framed photograph of someone you love. In my studio, I use classic styles and colors to create timeless portraits of your best friend. I know you will be excited to show them off to your friends and family. Will they think you are crazy for investing in portraits for your dog? Who cares, it is your baby, your best friend! Why not document the love that you shared? I promise it is worth EVERY PENNY! I am a Certified Professional Photographer who specializes in dog photography. I am located in Prosper Texas and serve North Dallas, Frisco, McKinney, Denton, and surrounding areas. Penny is amazing! She photographed 3 of my dogs and has done a great job with each one. If you are looking for a photographer with the experience to capture the perfect picture of your pet, she is the one. Love Heads or Tails Photography!! She photographed my two fur babies, a German shepherd, and a Yorkie. Loved all the pictures. She really captured their true personalities. She's a real animal lover and it shows. I would HIGHLY RECOMMEND Heads or Tails Photography for all your Pet Pics!!! Sign up for our quarterly newsletter featuring tips, tricks, recipes and all things doggie related..